The water-pistol is a harmless toy for children, but apparently it can be a lethal weapon too. This particular species of fish makes use of water jets and the laws of physics to aim at and stun its prey. The aptly named archerfish employs a unique process to hunt land based insects and small animals – it aims, spits, and stuns. It lurks under the surface of the water, waiting for unsuspecting insects to land nearby. Then, it spits out water jets at a great force, instantly killing the prey. The entire process takes just one-tenth of a second. An archerfish can bring down insects as far as three meters above the water’s surface. Once it selects the prey, it rotates its eyes so that the prey’s image falls on a particular part of the eye. Then it presses its tongue against the groove on the roof of its mouth to form a narrow channel, and contracts its gill covers to issue a powerful jet of water through the channel. The power of this shot can be altered for prey of different sizes. The jet can be up to five meters long. Surprisingly, research has showed that the force of the water that hits the insects is much higher than the force at which it leaves the archerfish. Which means the water gains speed, instead of losing it. This is opposite to how a ball or bullet behaves when it is fired. For years, scientists believed the archerfish had specialized internal muscles or organs that helped it spit very hard. But thanks to research done by physicists from the University of Milan, we now know that this isn’t the case. In fact, the fish’s forceful strike is formed externally, using water dynamics. 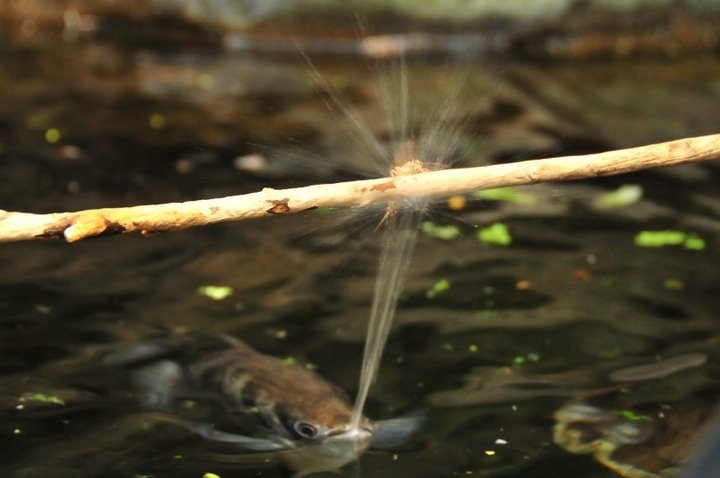 According to the new data, an archerfish is able to modulate the velocity of the water jet as it spits, so the shape of the jet changes through the air. When the shape changes, the head of the jet increases in volume from the liquid arriving from the tail, so a large drop is formed. This hits the insect with a force that is five times more than what a vertebrate muscle can generate. Also, an archerfish can instinctively take into account physics principles such as light refraction and the Plateau-Rayleigh instability to determine the true position of the prey (rather than the one perceived from underwater). So this tiny fish actually considers the way light bends as it enters the water, making it one of the most accurate hunters on the planet An adult archerfish is able to hit the target almost always on first attempt. And that’s not all. The archerfish even appears to know about gravity and how gravitational force bends the path of the water jet. After all, spit does not travel in a straight line because it is pulled down by the Earth’s gravity – it seems to know this intuitively. What the archerfish is doing, essentially, is solving physics problems. Of course, it is not really aware of this. For example, if an insect happens to be 10 centimeters above the surface of the water, the archerfish will factor in a ‘spit fall’ of 0 to 2 centimeters. If the insect is as far as 30 centimeters above water, the ‘spit fall’ would be 2 to 15 centimeters. The archerfish is a species made up of seven fish that belong to the genus Toxotes. They are found in India, Philippines, Polynesia and Australia, typically in waters of estuaries and mangroves. If you like shooting games or darts, perhaps you could learn a thing or two from the archerfish!